This study presents a selective method of isolation of zearalenone (ZON) and its metabolite, α-zearalenol (α-ZOL), in neoplastically changed human tissue by accelerated solvent and ultrasonic extractions using a mixture of acetonitrile/water (84/16% v/v) as the extraction solvent. Extraction effectiveness was determined through the selection of parameters (composition of the solvent mixture, temperature, pressure, number of cycles) with tissue contamination at the level of nanograms per gram. The produced acetonitrile/water extracts were purified, and analytes were enriched in columns packed with homemade molecularly imprinted polymers. Purified extracts were determined by liquid chromatography (LC) coupled with different detection systems (diode array detection - DAD and mass spectrometry - MS) involving the Ascentis RP-Amide as a stationary phase and gradient elution. The combination of UE-MISPE-LC (ultrasonic extraction - molecularly imprinted solid-phase extraction - liquid chromatography) produced high (R ≈ 95–98%) and repeatable (RSD < 3%) recovery values for ZON and α-ZOL. This article was published in the special issue Biomarkers with guest editors Boguslaw Buszewski and Jochen Schubert. Zearalenone (ZON), also referred to as F-2 toxin, is an estrogenic mycotoxin produced by selected fungi of the genus Fusarium: Fusarium graminearum, Fusarium culmorum, Fusarium cerealis, Fusarium equiseti, Fusarium crookwellense, and Fusarium semitectum (mostly F. graminearum and F. culmorum) . ZON and its metabolites have a toxic effect because their structure and shape resembles that of natural estrogens, such as estradiol, estrone, and estriol [2, 3, 4, 5]. ZON metabolism has been studied in pigs . Research results have shown that, in pigs and, probably in humans, ZON is rapidly absorbed after the ingestion of contaminated food, and it is very quickly metabolized in the intestines and liver [6, 7, 8]. ZON is reduced, mainly to α-ZOL, and in smaller quantities to β-ZOL (Fig. 1), which are then decomposed to α-ZAL and β-ZAL [5, 7, 9]. Hydroxysteroid dehydrogenase (HSD) plays a key role in those transformations. Since ZON has a very similar structure to estradiol, it becomes a substrate for 3α-HSD and 3β-HSD . ZON is metabolized to α-ZOL with the involvement of 3α-HSD and to β-ZOL with the involvement of 3β-HSD . Excessive levels of ZON and its metabolites are excreted from the body with urine and bile. Following the ingestion of a single ZON dose of 100 mg, its concentrations in urine decreased over time as an indication of ZON's metabolism. Zearalenone and its metabolites demonstrate genotoxic activity which results in DNA replication disruptions, chromosomal aberrations (changes in the structure or number of chromosomes), changes in sister chromatids (disruptions during the meiotic or mitotic division of separating chromatids that give rise to new chromosomes), induction of DNA fragmentation (deletion, inversion, duplication, translocation), cell cycle pause, inhibition of protein and DNA synthesis, and apoptosis [3, 11, 12, 13, 14, 15, 16, 17]. Every change in the DNA nucleotide sequence leads to mutations. Although some mutations are symptom-free, they exert an effect on the body. There exists a close correlation between mutations and the formation of neoplastic cells. Many mutagens are carcinogens, i.e., factors that contribute to the formation of neoplasms [3, 17, 18, 19]. 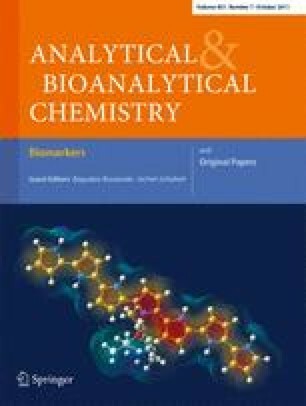 Analyses of toxic and harmful compounds occurring at low concentrations have prompted the search for selective methods of isolating and enriching those compounds from biological matrices, including highly complex matrices such as blood, tissue, and urine at low concentration levels [15, 20]. An alternative to traditional extraction methods could be posed by solid-phase extraction using selective adsorbents, such as molecularly imprinted polymers (MIP) for isolating and enriching zearalenone and its metabolites, in particular, from complex biological samples. MIPs are increasingly often used as packing for chromatography columns and adsorbents in solid-phase extractions as a relatively cheaper (in comparison with immunosorbents, for example) option that result in higher selectivity than traditional packing [21, 22, 23, 24, 25, 26, 27]. This paper investigates the use of molecularly imprinted polymers in purifying extracts and isolating zearalenone and its metabolite, α-zearalenol (α-ZOL), in neoplastic endometrial tissue. Scant sources suggest that this mycotoxin may be one of the causes of endometrial cancer. The experimental results of Urraca et al. [21, 22, 23] were used to produce a series of polymers with an imprinted cyclododecyl 2,4-dihydroxybenzoate (CDHB) particle, a structural analog of ZON. The physical and chemical characteristics of the synthesized CDHB and molecularly imprinted polymers (nuclear magnetic resonance - NMR, infrared spectroscopy- IR, scanning electron micrographs (SEM)) were determined. ZON and α-ZOL were extracted from tissue by accelerated solvent extraction (ASE) and ultrasonic extraction (UE). The obtained extracts were purified by molecularly imprinted solid-phase extraction (MISPE). This type of MIP-CDHB was used for isolating zearalenone and its metabolite and for purifying acetonitrile/water extractions from neoplastic tissue for the first time. Samples were analyzed by liquid chromatography with diode array detection (DAD) and mass spectrometry (MS) with an atmospheric-pressure chemical ionization (APCI) interface. ZON, α-ZOL, 2,2'-azobisisobutyronitrile, 1-allyl-piperazine (1-ALPP) (96%), trimethylolpropane trimethacrylate (TRIM; techn. ), cyclododecanol, 1,1’-carbonyldiimidazole (≥90%), dimethyl fumarate, 2,4-dihydroxybenzoate acid (97%), 1,8-diazabicyclo[5.4.0]undec-7-ene were purchased from Fluka (Sigma-Aldrich Chemie, Steinheim, Germany). For MISPE and chromatographic analyses, organic solvents of high performance liquid chromatography (HPLC) grade purchased from Baker (Groß-Gerau, Germany) and deionized water (Mili-Q, Millipore, El Paso, TX, USA) were employed. Aluminum oxide (150 mesh) and silica gel (230–400 mesh) for CDHB purification was supplied by Merck (Darmstadt, Germany). Anhydrous sodium sulfate (POCh, Gliwice, Poland) was the drying agent. Working solutions were prepared by weighing 1.09 mg zearalenone and 1.10 mg α-zearalenol and dissolving them in acetonitrile in 10 ml volumetric flasks. The produced solutions had the concentration of 109.0 μg/ml zearalenone and 110.0 μg/ml α-zearalenol. Solutions of lower concentrations were produced by diluting the working solutions to obtain concentrations of 0.01 to 3 μg/ml in the mobile phase. Liquid chromatography analyses were carried out using an Agilent Technologies 1100 chromatograph with an Ascentis RP-Amide column (Supelco, USA; 250 × 4.6 mm ID, 5 μm particle size) equipped with a DAD, mass spectrometer (MSD Trap VL Agilent), and an autosampler. Data acquisition and quantification were conducted using Agilent ChemStation software. The column was kept in an oven (Gynkotek, Germering, Germany) at a temperature of 21.0 °C ± 0.1. Chromatographic separations were performed using a gradient elution with acetonitrile (A) and water (B)—0–5 min, 50% A; 5–25 min 50–100% A; 35 min 100% A; 35–45 min 100–50% A; and 55 min 50% A. The flow rate was 1 ml/min; column temperature was kept at 21 °C, and analytical wavelength was set at λ = 270 nm. Injection volume was 10 μl. The mass spectrometer was equipped with an APCI source. The following APCI conditions were applied: ionizing gas (nitrogen), 60 psi; flow, 7.5 ml/min; auxiliary gas (helium), 10 psi; ion source temperature, 278 °C; gas drying temperature, 320 °C; and corona current, 3,000 nA. The mass spectra of the analyzed xenoestrogens were within the scanning range of 300–350 m/z in the negative ionization option at capillary voltage 4.0 V.
1H and 13 C NMR spectra were recorded with Bruker 300 MSL (Rhenstteten, Germany) spectrometer at 300 and 75 MHz, respectively. Infrared spectroscopy results were obtained on Perkin-Elmer 1800 (Norwalk, CT, USA) infrared spectrophotometer. Melting points were obtained with a Fischer Johns melting point apparatus. The porosity and surface area of the developed micro/nanospheres and bulk polymers were determined by nitrogen adsorption/desorption analysis using a nitrogen surface area analyzer (ASAP 2012, Micromeritics Instrument Corp., USA). SEM results were obtained using Leo 1430 VP apparatus (Leo, Electronenmikroskopie, GmbH, Oberkochen, Germany). Solid-phase extraction was performed using a 12-port vacuum manifold supplied by Mallinckrodt Baker (Deventer, The Netherlands). MISPE columns were prepared using solid-phase extraction (SPE) glass columns (volume of 1 ml) equipped with porous polytetrafluoroethylene (PTFE) disks (Mallinckrodt Baker) at the top and at the bottom of the polymer bed. Soxhlet extractions were carried out using an extractor supplied by Agat (Szczecin, Poland). The synthesis of the ZON-mimic template, cyclododecanyl-2,4-dihydroxybenzoate, has been described by Urraca et al. [21, 23]. For the purpose of obtaining pure cyclododecyl 2,4-dihydroxybenzoate, its synthesis was modified by annealing silica gel at 120 °C for 24 h until the purification stage. Elution was carried out using an n-hexane: octane ethyl mixture (60:40% v/v). The product was crystallized and dried in a vacuum drier, producing a white solid substance with melting point in the range of 57.5 °C to 61 °C. Nuclear magnetic resonance was performed for 1H and13C to verify the product's structure. Deuterated chloroform was applied as the solvent, and trimethylsilane was the reference standard (Fig. 2a, b). The IR spectrum was obtained by preparing a KBr sample. It was used to determine vibrational frequency ν: 3,487; 3,161; 3,933; 1,656; 1,469; 1,253; 852; and 779 cm−1. Two types of polymers were prepared simultaneously. In the first polymer, 1 mmol cyclododecyl 2,4-dihydroxybenzoate (MIP) was used as the template, while the second polymer was prepared without a template to produce a non-imprint polymer (NIP). The initiator in the synthesis of both polymers was 2,2'-azobis(isobutynitrile) (0.47 mmol). 1-Allyl-piperazine (4 mmol) was the functional monometer; TRIM (20 mmol) was the cross-linking monomer, and acetonitrile was the pore-forming solvent [22, 23]. The monomer to pore-forming solvent volume ratio was 40:60. Polymerization was carried out twice in tight vials of 15 and 2 ml. Polymerization mixtures were degassed in an ultrasound bath and rinsed with nitrogen for 30 min. Vials were placed in a chamber with a thermostat-controlled water bath (4 °C) and a UV lamp (λ = 365 nm). Photopolymerization was carried out for 1.5 h. The probable location of hydrogen bonds between a CDHB molecule and 1-ALPP molecules is shown in Fig. 3. Polymers were disintegrated; the template and non-reacted substrates were extracted with a methanol and acetic acid mixture (96:4% v/v) in a Soxhlet apparatus over 24 h, because ASE did not fully remove the template. Non-imprinted polymers were prepared following the same procedure but in the absence of template molecule. Structural variations in the surface morphology and internal structure of the both MIP and NIP polymer particles resulting were studied by the SEM microscope (Fig. 4). The SEM microscopic technique confirmed that the application of acetonitrile gave rise to a higher number of specific interactions between CDHB template and monomers (1-ALPP), resulting in compact and more porous morphology of the imprinted polymers. CDHB binding with 1-ALPP during MIP synthesis produced larger globules and pores in comparison with NIP molecular imprinting without template. The non-imprinted polymer had very small surface globules. The polymer was dried in a vacuum drier at 50 °C for 24 h, producing polymers with a specific surface area of 248 m2/g and a pore volume of 0.46 cm3/g. The dried product was disintegrated in a mortar and fractioned with the use of mesh sieves. The obtained fractions had grain size of 45 to 63 μm, and they were used to fill SPE columns. Samples of uterus tissue were collected from seven women with endometrial cancer aged 66–76 years during a surgical procedure. Directly after collection, samples were placed in a dark container and frozen in liquid nitrogen. In view of the small quantity and weight of the collected samples, veal and poultry muscle tissue and poultry liver, whose consistency was most similar to neoplastic tissue, were used to investigate extraction and purification effectiveness. Animal tissue samples were freeze-stored. Frozen animal tissue was disintegrated and analytical samples of 0.5, 1, 1.5, and 2 g were prepared. Tissue was contaminated with 100 μl standard solution of zearalenone and α-zearalenol, each with the estimated concentration of 10 μg/ml. They were subjected to UE and ASE by applying different extraction conditions, solvents, and solvent combinations (Tables 1 and 2). In the ultrasonic extraction, each sample was twice extracted using a mixture of acetonitrile (ACN)/H2O (84:16% v/v), ACN/MeOH (50:50% v/v), ACN/H2O (50:50% v/v), ACN/MeOH (84:16% v/v), and MeOH/H2O (80:20% v/v) of 15 ml each. When 15 ml of the solvent mixture was added, samples were ultrasonically homogenized (5 min, five cycles, 100% power). The supernatant was centrifuged for 12 min (3,500 rpm). In ASE (extractor ASE 100, Dionex), each sample was extracted with different solvents and temperatures (Table 1) under pressure of 1,500 psi. A total of five static cycles were used at 5 min per cycle, with a final flush of solvent equal to 75% of the cell volume (approx. 11 mL). UE- and ASE-derived extracts were evaporated to 2 ml and diluted with water at the 1:5 ratio. The filtered supernatant was transferred to MIP-CDHB columns conditioned with 5 ml methanol and 5 ml redistilled water. After application, the polymer was rinsed with 5 ml redistilled water. The sorbent was dried, and the adsorbed analytes were eluted with the solvent. Due to the absence of documented experiments aiming to isolate selected analytes from human tissue and very few studies investigating animal tissue, mixtures of solvents with various compositions were used as extractants for ASE (Table 1) and UE (Table 2). In view of the complexity of biological matrices, the isolation procedure and the sample purification process required a solvent capable of removing proteins and fats. The recovery values for both analytes after UE-MIP-CDHB with the use of various solvent combinations (methanol/water, acetonitrile/water) and different volume ratios were within the range of 82.5–97.9%. The best results were noted for the ACN/H2O mixture at the volume ratio of 84:16% v/v where α-ZOL recovery reached 97.9% and ZON recovery, –95.4%. Low standard deviation values of 0.2–2.1% testify to the high repeatability of isolation and purification of tissue supernatants with the use of CDHB-imprinted polymers which are selective sorbents. Tissue supernatants produced with the use of solvents specified in Table 2 were deproteinized and degreased with hexane. Low recovery values were obtained for both compounds (ZON and α-ZOL) at 5.49% ± 2.6% and 4.94% ± 2.2%, respectively. Excessive acetonitrile concentrations in the sample applied to fill the column lowered the analyte's reaction with the polymer. For this reason, acetonitrile/water extracts (84:16% v/v) from acetonitrile/water extract tissue (84:16% v/v) were diluted with water at the 1:5 ratio without hexane degreasing, and they were applied to the conditioned MIP-CDHB polymer bed. Recovery reached 95–97%, indicating that sample deproteinization and degreasing were redundant. Similar results were noted in accelerated solvent extraction (Table 3). The recovery values reported for extracts with the use of the 84:16% v/v ACN/water mixture were the highest for poultry liver and poultry muscle tissue (62 - 90%). Similarly to temperature growth, an increase in the number of extraction cycles contributes to higher recovery values (5 cycles, 200 °C, 64 ml). The highest recovery values for zearalenone (89.8%) and for α-zearalenol (90.1%) were reported for four extraction cycles with a combination of ACN/H2O (84:16% v/v) solvents at a temperature of 200 °C. The use of pure solvents, i.e., acetonitrile, methanol, and chloroform, did not bring satisfactory results. Recovery values were significantly lower (more than 50%) compared with those obtained with the use of the above solvent mixtures (Table 3). When non-imprint polymers (NIP) were used, recovery values for both ZON and α-ZOL dropped by 40% in comparison with MIP-CDHB. The repeated use of the NIP column led to an increase in the intensity of peaks generated by the coexisting compounds. An increase in the quantity of the above polymer had no significant effect on extract purification. In both extraction methods (UE and ASE) used to isolate ZON and α-ZOL, the most satisfactory results were reported in respect of ACN/H2O (84:16% v/v) and ACN/MeOH (84:16% v/v), and the above mixtures were taken into account during the selection of extraction parameters in the MISPE analysis. To verify adsorption and desorption effectiveness, glass SPE columns were packed with the same polymer in increasing quantities from 50 to 250 mg. Tissue extracts containing zearalenone and α-zearalenol in concentrations of 109 and 110 ng/g, respectively, were applied to each column. The results are presented in Table 4. For the purpose of verifying the effectiveness of zearalenone and α-zearalenol desorption with MIP-CDHB, various volumes of acetonitrile were applied as the solvent. The highest recovery values were reported for 4 ml, reaching 97.9% for zearalenone (±0.8%) and 95.4% for α-zearalenol (±1.4%). Standard deviation was below 1.5%, and the above quantity was regarded as optimal for effective desorption. The highest recovery values in excess of 90% were noted in columns packed with 200 and 250 mg MID-CDHB for both solvent combinations. In view of repeatable (RSD below 2%) and high recovery values, ZON and α-ZOL were extracted from neoplastic tissue by the ultrasound-assisted method with the involvement of ACN/H2O (84:16 % v/v) and purified using 200 mg MIP-CDHB. The applied method was validated based on the following parameters: linearity, selectivity, precision (repeatability), measurement uncertainty, and accuracy. Calibration curves were determined for the tissue extract (UE-MISPE), which were linear in the range of concentrations from 0.054 to 10.9 μg/ml for ZON (y = 43.252x + 1.3316) and 0.055 to 11.0 μg/ml for α-ZOL (y = 34.28x + 0.7014). Linearity was satisfactory in both cases, as demonstrated by high regression coefficients (r = 0.9999 for ZON; r = 0.9998 for α-ZOL). The limit of detection for tissue extracts was computed at the signal-to-noise ratio of 3:1, and the limit of quantification—at the signal-to-noise ratio of 10:1 (Table 5). The values reported for liquid chromatography-diode array detection (LC-DAD) are insignificantly higher in comparison with fluorescent detection [21, 23], therefore mass spectrometry was used to confirm analyte identity. Coefficients of variation (RSD, %) were used to determine assay precision. RDS values, expressed as the percentage arithmetic mean (Table 6), were below 4.1% and can be considered satisfactory. The results of the analysis indicate that the neoplastically changed tissue samples collected from all patients contained zearalenone's estrogenic metabolite, α-zearalenol, which bears a structural resemblance to natural estrogen, 17-β estradiol, and imitates its activity. Trace quantities of zearalenone were found in three samples. Zearalenone was not determined in the remaining four samples. All tissue samples contained various quantities of α-zearalenol in the range of 0.1–1.7 μg/g tissue (Table 7, Fig. 5). No correlations were determined between the α-zearalenol content of the examined tissue and the clinical grade of cancer. Tumor consistency and the quantity of α-zearalenol were correlated (the more compact the tissue, the smaller quantity of the metabolite was found). The presence of α-zearalenol and zearalenone in tissue affected by endometrial cancer was confirmed by the MS in the negative ionization module (Fig. 6). The presence of α-zearalenol and zearalenone in neoplastically changed tissue from the tissue corpus of the uterus was confirmed by ions with m/z ratios of 317.1 and 319.0, respectively. Highly efficient molecularly imprinted polymers (MIP-CDHB) may be used as sorbents in solid-phase extraction for purification extracts of tissue and preconcentration ZON and α-ZOL. The studied MIPs are characterized by high selectivity, and they shorten sample preparation time—the results of this experiment have shown that hexane deproteinization and degreasing of supernatants were redundant. The presence of α-zearalenol was determined in all uterus samples, while zearalenone was found in only three samples. No correlations were determined between the α-zearalenol content of the studied tissue and the clinical stage of cancer. Tumor consistency and the quantity of α-zearalenol were, however, correlated (the more compact the tissue, the smaller the quantity of the metabolite). The results of this study indicate that in contrast to affinity adsorbents, molecularly imprinted polymers are suitable for purifying samples from the water-organic phase. The work was financially supported by the Ministry of Science and Higher Education (Warsaw, Poland) grant no. N N204 012038.